MOUNTAIN VIEW, Calif., Sept. 13, 2016 /PRNewswire/ — Based on its recent analysis of the food intolerance testing market, Frost & Sullivan recognizes Cell Science Systems Corporation (CSS) with the 2016 North American Company of the Year Award. CSS has done a remarkable job of sustaining its market leadership over the last 20 years on the strength of its flagship Alcat Test, a cellular test for food, chemical, mold, functional food, additive, and drug sensitivities. The results translate into benefit for many clinical conditions such as overweight, gastrointestinal disorders, skin rashes, arthritis, migraine and many others. The company’s advanced testing solutions present valuable advice and quantitative data that aid customers in changing their food habits to lead healthier, happier lives. The Alcat Test is the only technology in the market to have been clinically validated after rigorous tests by independent bodies. CSS is the only company in this space to be a US Food and Drug Administration (FDA)-registered medical device manufacturer that voluntarily maintains ISO EN 13485 certification. It is fully vertically integrated, from instrument manufacture to test reagent production, and complies with current good manufacturing practice (cGMP) regulations. This will hold it in good stead when the FDA begins to regulate lab-developed tests (LDTs), as it currently does with medical devices. CSS’s Alcat Test identifies changes in blood cell sizes in response to exposure to foreign substances. After the removal of red blood cells, white blood cells are incubated with purified food extracts or other test substances. Changes in cell size and number are measured through the impedance method, the international standard of particle sizing and counting. A proprietary algorithm facilitates statistical comparison of a patient’s normal cell profile with post-incubation samples. “We are delighted to be recognized as a leader in the food sensitivity and intolerance testing market. Recent clinical testing continues to indicate the importance of understanding the relationship between food sensitivities, inflammation and the innate immune system in our overall health and wellness,” stated Roger Deutsch, President and CEO of Cell Science Systems. Since the first commercialization of the test in the late 1980s, CSS has collaborated with a number of academic institutions and clinics that have assessed and validated the technical and clinical utility of the Alcat Test. Academic institutions involved in these trials include the Yale School of Medicine, Northern Illinois University, University of Pavia, and Baylor Medical College, Sports Medicine and Performance Institute. CSS partners with providers such as Any Lab Test Now and other Walk-in Labs to offer direct-to-consumer testing solutions. As competitors tend to focus on test results and not the transferability of the information to the patient, customers often find it challenging to glean useful information from the voluminous data. CSS, on the other hand, ensures that its actionable data are color-coded and quantitatively presented in an easy-to-understand format in addition to offering personalized consulting with physicians and nutritionists. With the success of its flagship product, CSS is expanding its portfolio to cover bowel disorders such as celiac disease, irritable bowel syndrome (IBS) and Crohn’s disease with its CICA profile solution (Celiac, IBS, Crohns’ Array). It continues to strengthen its profile in the chronic disease segment with its MethylDetox Profile, which helps customers understand their genetic constitutions and address health issues by changing their diets and nutritional intake. Customers find value not only in CSS’s tests but also its consulting and support services. 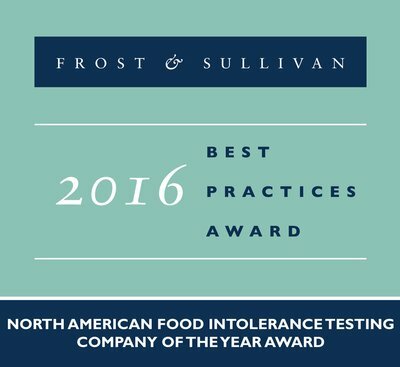 For its overall excellence in growth, innovation, and visionary leadership in the food intolerance testing market, Frost & Sullivan is thrilled to present CSS with the 2016 North America Frost & Sullivan Company of the Year Award. Each year, Frost & Sullivan presents this award to the company that has demonstrated superiority in devising a strong growth strategy and implementing it. The recipient has shown strength in terms of innovation in products and technologies, leadership in customer value, as well as speed in response to market needs. In short, the award looks at the emerging market players in the industry and recognises their best practices that position them for future growth. Cell Science Systems (cellsciencesystems.com) is a specialty clinical laboratory that develops and performs laboratory testing in immunology, cell biology, molecular diagnostics, and other specialties, supporting the personalized treatment and prevention of chronic disease. Cell Science Systems, Corp. operates a CLIA certified laboratory and is an FDA inspected registered, cGMP medical device manufacturer meeting ISO EN13485 standards. Cell Science Systems is best known for pioneering the Alcat Test® for food and chemical sensitivities. The company operates a wholly owned subsidiary in Europe.